LOS ANGELES, CA--(Marketwire - May 16, 2008) - Los Angeles can lay claim to more than the Hollywood Bowl, Grauman's Chinese Theatre and the Venice Beach boardwalk. Sprawling through 160,000-plus acres of the city, and no less stimulating, is the world's largest urban national park -- the Santa Monica Mountains National Recreation Area -- and Griffith Park. To better understand, appreciate and protect this natural treasure, the National Park Service and National Geographic Society have joined forces to host the Santa Monica Mountains BioBlitz, May 30 and 31, noon to noon. Joining the national sponsors are California State Parks, Santa Monica Mountains Conservancy and Los Angeles Recreation and Parks Department. The Celebrate BioDiversity Festival follows the afternoon of Saturday, May 31, after the initial BioBlitz species count is announced. Open to the public (no registration required), it will offer such family entertainment as the Banana Slug String Band, Billy B and the Culver City Dub Collective. The public will be able to speak to scientists and enjoy the wonders of the park at this time. Part scientific endeavor, part festival and part outdoor classroom, the BioBlitz will draw together hundreds of scientists, naturalists, adventurers, community leaders, more than 1,400 Los Angeles schoolchildren and volunteers for all ages to participate in a 24-hour race to discover and record as many plant and animal species as possible. In this extraordinary experience open to the public, volunteers of all ages are needed to work alongside hundreds of experts to help count species of bugs, birds, butterflies, bats, wildflowers and other plants and animals that call the Santa Monica Mountains and Griffith Park home. 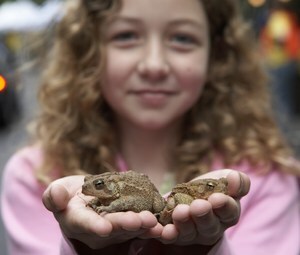 Parents and caregivers are encouraged to bring children to the BioBlitz. While children ages 8 and older may want to participate on inventory teams with their parents, there also will be age-appropriate activities for younger kids at Paramount Ranch "base camp." Paramount Ranch base camp, located at 2903 Cornell Road, Agoura Hills, will be the dynamic center of activity. Participant check-in begins at 10 a.m. on Friday, May 30, for the initial inventory teams. Festivities will begin at 11:30 a.m., with a kickoff ceremony bringing together representatives, collaborators and agencies from Los Angeles' scientific, conservation, political and entertainment communities. The 24-hour race to document the biodiversity of the Santa Monica Mountains will begin promptly at noon, when teams will go near and far across the mountains to begin the nature inventory. Inventory teams are organized in four-hour time slots. There will also be exploration opportunities closer to base camp for people interested in shorter excursions. At base camp, people can watch scientists doing round-the-clock research to identify and document species collected in the field. Additional activities throughout the day and night at base camp include talks by experts, displays and demonstrations, entertainment and children's activities. Ray Sauvajot, chief of planning, science and resource management, Santa Monica Mountains National Recreation Area, said, "I see a rising awareness of the amazing diversity that is literally in our backyards in Los Angeles. We are bringing together families, schools and related organizations to have fun, working alongside the top scientists of our generation. We are providing a hands-on experience, using real scientific techniques and equipment with expert guidance and increasing the everyday knowledge of how scientists understand that diversity." "As a parent with two young boys, I know how programmed and wired kids are today, and unstructured time playing and exploring outdoors is often lost in the mix," said John Francis, National Geographic's vice president of research, conservation and exploration. "Nature Deficit Disorder, as coined by Richard Louv, reveals that this disconnect with nature is hurting today's youth physically and mentally. Our children will also be tomorrow's caretakers of the planet. We hope the BioBlitz will introduce kids to the amazing natural world in their own backyard and inspire people to enjoy and preserve natural treasures in the Santa Monica Mountains and beyond." BioBlitz inventories are being staged simultaneously at five additional field stations where pre-registered participants can meet. Areas selected for their varied ecological conditions include Griffith Park, King Gillette Ranch, Leo Carrillo State Park, Malibu Pier and Lagoon and Topanga State Park. Activities include exploring tide pools, catching butterflies with nets, searching for hidden wildflowers in the canyons and observing and catching owls with nets at night. National Geographic has had a close relationship with the National Park Service from the start. The Society helped draft the legislation to establish the Service in 1916. It has given grants to establish or sustain national parks and has extensively covered the parks across its media for nearly a century. The Santa Monica Mountains BioBlitz is part of the Society and National Park Service's latest joint venture. The Santa Monica Mountains BioBlitz is the second of 10 annual BioBlitzes that will be held at urban national park units around the country, leading up to the Park Service's centennial in 2016. The first was held at Rock Creek Park in Washington, D.C., last year. 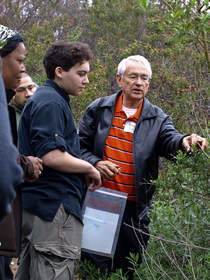 Said Woody Smeck, superintendent at Santa Monica Mountains National Recreation Area, "We are excited to host the 2008 BioBlitz. Los Angeles is fortunate to have such an amazing natural oasis in its backyard. The BioBlitz will be a great opportunity for people to explore this treasure and observe firsthand the incredible diversity of life in the mountains while recreating and rejuvenating their spirits in the outdoors." Registration is required for all BioBlitz participants. Online registration is now open at www.nationalgeographic.com/bioblitz, and pre-registration is required to ensure placement in field inventory teams. For more information about the Santa Monica Mountains BioBlitz, registration, volunteer and participation opportunities, visit www.nationalgeographic.com/bioblitz. Drop-ins are welcome for the Celebrate Diversity Festival and for general exploration of base camp. Information is also available by calling (800) 638-6400, ext. 6186. To reserve a limited free bus seat on May 31 with a 9 a.m. departure from the Natural History Museum, 900 Exposition Blvd., call 213-763-ED4U. Return buses from Paramount Ranch are at 4 p.m. and 6 p.m. The Santa Monica Mountains rise above Los Angeles, widen to meet the curve of Santa Monica Bay, and reach their highest peaks facing the open ocean. The land is beautiful and diverse, featuring a rugged coastline with narrow, sandy beaches and rocky shores, canyon walls with dense chaparral and fragrant sages and inland grassy hillsides. In 1978 Congress established the Santa Monica Mountains National Recreation Area as part of the national park system. Visit www.nps.gov/samo. The National Geographic Society is one of the world's largest nonprofit scientific and educational organizations. Founded in 1888 to "increase and diffuse geographic knowledge," the Society works to inspire people to care about the planet. It reaches more than 300 million people worldwide each month through its official journal, National Geographic, and other magazines; National Geographic Channel; television documentaries; music; radio; films; books; DVDs; maps; school publishing programs; interactive media; and merchandise. National Geographic has funded more than 8,800 scientific research, conservation and exploration projects and supports an education program combating geographic illiteracy. For more information, visit www.nationalgeographic.com. 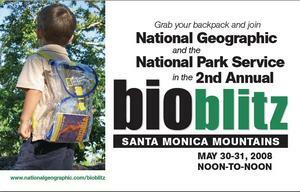 Click here for the Santa Monica Mountains BioBlitz and Celebrate BioDiversity Festival schedule.